Discussion in 'Boxing Discussion' started by XCuTioNeR, Aug 15, 2016. Must be just the one fight. The undercard is pretty weak. It's a one fight telecast, with the women's fight on NBCSN. Crawford should sign with Haymon and move up and fight Spence. That would be a great fight. That would be putting it mildly. Don't know anything about Bundu, doesn't sound like he brings anything. He actually hung in there with thurman and went the distance. He just has 0 chance of winning. Just a tough, experienced guy basically? Pretty much. He's mostly fought in Italy, so no one knows anyone he's fought. That's unfortunate, I like Spence, would like to see him tested. In time. I think the way he rolled over Algieri said a lot. CatchnShoot and robjenkins2 like this. Yeah that was super impressive. I think its a waste of a fight considering they will have a 20 million viewer lead-in. I can understand they want to showcase Spence in front of 20 million +, but this is the type of fight you put Thurman/Porter on. Lol at Bundu. The promotional warm body to keep a fighter's name in the headlines while they may (or may not) look for bigger fights. Ah well, hopefully we see some big fights from PBC. You can only let something simmer for so long before you botch things. Thats actually a smart move. 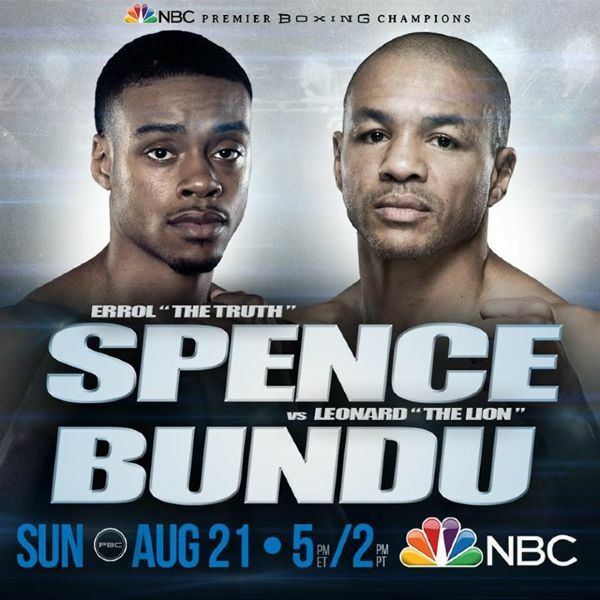 You'll get good viewership from the game and then people will see Spence demolish Bundu. Yeah but I wish they put a more competitive fight on that timeslot, like Spence vs Garcia. It's a rare timeslot and PBC is really lucky to get that as part of the deal. E is on weight. He's going to kill him.